The flagship, small-batch release, heroes the depth and maturity of the high-altitude vines, they are crafted from the estates best hand-selected blocks. 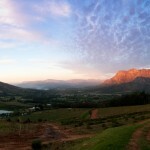 As the name Skyfall alludes, the 18-year-old Cabernet Sauvignon vines drift down from the Banhoek skyline. The exquisite individual pockets reach up to 500m above sea level. Cabernet Sauvignon makes up 70% of the vines planted on the estate. It has taken years of care, to coax the absolute best ‘personality’ from the diverse parcels of vines. The very first release of our premium, limited release Cabernet Sauvignon. Intensely flavoured, small berries were carefully hand sorted to give the finest expression of the terroir. Smooth and dense, with a crushed velvet mouth feel, Skyfall is bold and fresh, with well-structured tannins and excellent ageing potential. If you can resist, be patient and wait a couple of years until you uncork the bottle. Each of the 8 blocks of Cabernet Sauvignon are individually pruned and cared for to encourage character development, then separately harvested and vinified. Only the very best rows and blocks were selected, for a small-batch of the premium Cabernet – ‘the fingerprint of the harvest’. Fermentation lasts up to 14 days and then a further maceration period commences before the must is pressed and moved to oak. 70% new French Oak and 30% second fill French oak was used to mature this Cabernet Sauvignon for 18 months. *A minimum orders of 6 bottles (one case) is required. Excellent with grilled steak and salad, or venison pie.